POT, SMOKING AND THC ARE ALL THE DEVIL!!! DAMN THOSE HARVARD UNIVERSITY PROPAGANDISTS!!! Lighting up giving you aches? Try some MJ space cakes!! THC is your friend…weed tinctures will help you mend!! Smoke make you recoil? Try hemp oil!! Perhaps our friend Bob is anti smoke,not anti marijuana’s benefits? You see Bob, just because I enjoyed drinking a relaxing tea made out of stinging nettles today doesn’t mean I want to rub those same stinging nettles on my private parts. What’s my point? Hate the bad delivery system, not the incredibly beneficial plant. But since Chong is a singular example and an anecdotal (not clinically relevant) example and he is indeed now actually TREATING HIS PROSTATE CANCER WITH HEMP OIL http://www.cbsnews.com/8301-31749_162-57450353-10391698/tommy-chong-using-pot-to-treat-prostate-cancer/ maybe he is a bad example for your position in the argument and even better, a solid example for my side of the argument (thanks!). Pot isn’t the devil Bob, ignorance is. Today is April 20th but besides that it is also 420. What is 420? What does 420 mean? There are varying theories on the origin of 420. Some say that 420 originated from a police code that announces marijuana use is taking place. Yet another story is that a group of guys (Waldo’s) in the 1970’s made 4:20 their official meeting time to smoke marijuana after school. Whether or not 4:20 p.m. is the best time of day for your first hit depends on your own body, your own needs. Some folks feel that waiting until 4:20 enhances ones appreciation of the herb. Of course, your mileage may vary. In the 21st Century, 420 is firmly established as a code amongst tokers, a time of day and even sort of a toker’s New Year’s Day. It’s in our culture now and only time will tell where it ends up. April 20th (4/20) is another usage, meaning that it is time for to plant before the summer. Whatever the real story is, 420 has been an important part of the marijuana culture since the 1970’s. The significance of 420 has been kept underground and is mostly known only among marijuana smokers. Many non-smokers aren’t aware of the symbolism when they see someone wearing a T-shirt or baseball cap that says 420 across the front. When the 420 icon is somehow discreetly worked into a mainstream product like a film, marijuana users take notice. The film Pulp Fiction is rumored to have had all clocks throughout the movie set to 4:20. Marijuana smokers familiar with the symbol picked up on it—most people, however, did not. While some marijuana smokers are using 420 as a code that enables them to openly speak about marijuana in front of parents or teachers. 420 has been to some, a sacred symbol for nearly 30 years. Simply put, 420 is a symbol of cannabis and its culture. Today, April 20th events are international, and 4:20 pm has become sort of a world wide “burn time”. Faculty Evaluator: Mary King M.D. This clip is from the recently-aired PBS documentary, ‘Clearing the Smoke: The Science of Cannabis,’ which explores the scientifically proven fact that cannabinoids kill cancer cells in test tubes and in laboratory animals. Cannabinoid receptors exist throughout organs of the human body, especially in the brain and in the immune system. These act like targets for cannabinoids. Once they bind to the receptors, peptides are released that tell the cancer cells to die, i.e., to commit suicide. One doctor interviewed has been so encouraged by the laboratory results that he has begun cannabis trials with his own leukemia patients. 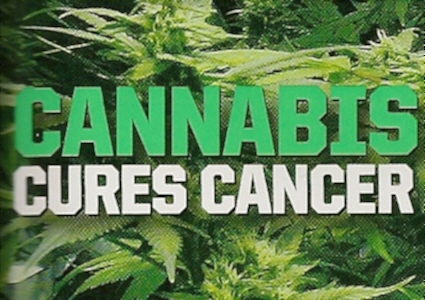 Medical Marijuana Cannabis Cures Cancers. They’ve been trying to treat fetuses in the womb with stem cells for awhile now (adult stem cells, NOT embryonic! embryonic can cause tumors!) In the past, they tried to use the baby’s own stem cells…with mixed results. Treatment with adult stem cells, due to the amazing transformation from blindness to sight, are some of the most powerful success stories in adult stem cell treatments. · Jakob Bielski from Canada received stem cell treatment because he couldn’t see at all and had no response to light. After the Cord Blood Stem Cells Were Implanted he has some vision, can respond to visual information and responds to light. · Xavier Carballo’s ophthalmologist, Dr. Jack Guggino of Tampa, said he did a baseline exam on the boy before the trip to China and after his return. Before the treatment Xavier could only detect hand motion at 1 to 2 feet, and after the treatment he could count fingers at 3 to 4 feet. “As far as Xavier is concerned, there has been definite and measurable improvement, neurologically and ophthalmologically,” Guggino said. · Blind Man Can See Again After Stem Cell Therapy – A man blinded after having ammonia squirted in his eye is now able to see again thanks to adult stem cells taken from his own body. Russell Turnbull, 38, from England had therapy using stem cells taken from his other eye in a research study in London. VIDEO: Meet Sam, a visual artist who was confronted with the one thing a man in his profession fears most: Compromised vision. In his case his ability to see clearly was being undermined by age-related macular degeneration (AMD.) His Doctor harvests and uses a patient’s own stem cell-rich bone marrow to help effect healing. Sam discerned improvements in his vision within the first ten days following his treatment and siz weeks later the vision in his left eye had improved while that in his right eye was now normal. TACOMA, Wash. — The city of Tacoma has ordered eight medical marijuana dispensaries to shut their doors by Saturday because the city believes they are breaking state law. Marijuana providers told The News Tribune the city is misinterpreting the law. Medical marijuana supporters planned to show up at Tuesday’s city council meeting to fight the move. Philip Dawdy of Sensible Washington estimates the Tacoma dispensaries serve more than 10,000 patients in the area. via Tacoma closing medical marijuana dispensaries. A state Capitol hearing today on how Proposition 19 may affect the future universe of California produced such disparate views that Assemblyman Tom Ammiano pondered the potential outcomes as perhaps only he can. “A drug czar today could be on Dancing With the Stars tomorrow,” he said. It was a light moment in a otherwise serious discussion over how California and its local governments will be impacted if voters pass the initiative to legalize marijuana for recreational use, permit small residential cultivation and allow cities and counties to tax and regulate retail pot sales. On one side of the argument was Sacramento County District Attorney Jan Scully. Speaking on behalf of the California District Attorneys Association, she argued that the measure would do little or nothing to combat crime and would create an utter morass for local municipalities. “It will not impede the drug cartels that are coming across our border and actually growing on our state and federal lands,” Scully told the joint legislative public safety committee hearing chaired by Ammiano and state Sen. Mark Leno, two San Francisco lawmakers and Prop 19 supporters. But Prop 19 campaign spokeswoman Dale Sky Jones argued that California’s initiative will bring about changes mirroring the end of alcohol prohibition if passed. Jones also argued that the flexibility of the measure in allowing local governments to decide whether or not to allow retail pot operations – and determine how to tax them – is a plus. Rand Corp researcher Beau Kilmer reiterated findings of the think tank’s recent study, declaring that California marijuana prices could plummet by 80 percent if Proposition 19 passed. Kilmer also said marijuana use could go up by between 50 and 100 percent. via Sacramento Bee — Weed Wars. SACRAMENTO, Calif. — A coalition of medical marijuana advocates came out Tuesday against a California ballot initiative that would legalize the drug for recreational use and tax its sales. Proposition 19 would inadvertently harm the most vulnerable patients by allowing local governments to prohibit the sale and purchase of marijuana in their jurisdictions, California Cannabis Association members said. At a gathering outside the Capitol, the group predicted many cities and counties would impose such bans if voters approve the initiative, leaving local medical marijuana users with few options. “The people who would be most affected are the sick, the elderly — patients who cannot grow their own and cannot travel to pick up a prescription,” said Amir Daliri, president of Cascade Wellness Center, a medical marijuana dispensary north of Chico. Supporters of Proposition 19 said it explicitly protects the rights of patients and would provide them with safer and easier access to the drug by creating a strictly controlled, clearly defined legal system for pot cultivation, distribution and sales. If Proposition 19 passes in November, California would become the first state to legalize and regulate recreational pot use. Adults could possess up to one ounce of the drug. Supporters have targeted two areas of concern for voters: the economy and crime. Legalized pot would bring much-needed revenue to the state and reduce the influence of drug cartels, they said. The measure was endorsed Tuesday by the largest labor union in the state. The Service Employees International Union, which has 700,000 members, said revenue generated by the initiative would help California preserve jobs and avoid cuts to key services such as education and health care. The union represents workers in health care, building services and state and local government. Critics question the economic effects and contend the initiative will simply serve to boost marijuana usage and drug-related crimes. A Field Poll released in July found 48 percent of likely voters opposed the measure, while 44 percent supported it. via The Associated Press: Medical pot advocates oppose Calif. legalization. Auburn Hills — A 43-year-old medical marijuana card holder was charged Thursday with violating state law by illegally growing plants in the back yard of his home and within 1,000 feet of an elementary school. Mark Alan Rowe of Auburn Hills is charged with one count of manufacturing the controlled substance of marijuana in connection with a search warrant executed Wednesday at his home on Caroline Street. The offense is a felony punishable by up to four years in prison and a $20,000 fine. Rowe, who was released on $10,000 personal bond, holds a valid Michigan Department of Community Health medical marijuana patient ID card. Auburn Hills Lt. Casimir Miarka said police received a tip Tuesday that marijuana was being grown in Rowe’s back yard and officers confiscated 12 plants from the yard, which has a four-foot high chain link fence. Miarka said some plants were more than six feet tall. Rowe could not be reached for comment Thursday. via Medical marijuana user charged with growing plants in yard | detnews.com | The Detroit News.